Earlier this year, U.S. President Donald Trump’s praise of one of his favorite strongmen, Egyptian President Abdel Fattah al-Sisi, was effusive. “El-Sisi is moving his country to a more inclusive future!” Trump exclaimed in a tweet about the opening of a huge new cathedral outside Cairo, which was built by the Egyptian military and is the largest in the Middle East. Trump’s tweet echoed one of the main arguments of Sisi’s backers. 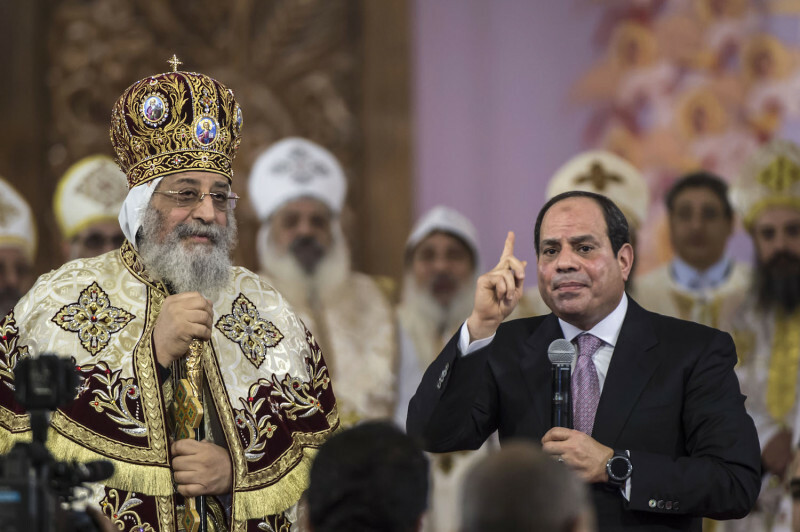 Sure, he is a military-backed authoritarian, the thinking goes, but he’s also the kind of Muslim leader who fights Islamist extremism and champions equal rights for religious minorities, especially Egypt’s Christians. Sisi has worked hard to craft his enlightened image. 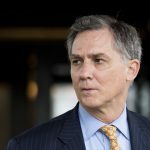 Since seizing power in a 2013 coup, he has expressly portrayed himself as a heroic reformer of Islam—he has called on scholars at Al-Azhar University, one of the country’s most prestigious religious institutions, to re-examine controversial Islamic teachings—and a protector of Christians, who constitute some 10 percent of the population. Sisi has charmed many a delegation of Americans, who return from Cairo and write glowingly of his courage on religious freedom. When Sisi visits the White House on Tuesday, the U.S. administration is likely to bestow on him yet more compliments in this vein. But even a quick look at Sisi’s actual record shows how misplaced such praise is. Initially, many Egyptian Christians did welcome Sisi’s ouster of the elected but illiberal Muslim Brotherhood government, hoping he would usher in a new era of security and reform. But over the past several years, disillusionment has set in. Under Sisi’s repressive rule, the Egyptian state continues to treat members of minority faiths as second-class citizens. Sisi has done nothing to address pervasive problems such as economic discrimination toward non-Muslims; the presence of a “blasphemy” clause in the penal code that the government wields against alleged critics of Islam; the authorities’ persistent failure to prevent sectarian attacks on Christians; discriminatory restrictions on church building; and an absence of even the most basic legal rights for members of faiths other than Islam, Christianity, and Judaism. Sisi has done nothing to remove barriers to hiring or promoting Christians in several key sectors. Samuel Tadros, a senior fellow at the Hudson Institute, has described how “Copts are excluded from Egypt’s intelligence service and state security, their percentage in the armed services and police force is capped at 1%, and they are similarly discriminated against in the foreign service, judiciary, education sector and government-owned public sector.” The 2018 annual report of the U.S. Commission on International Religious Freedom notes that “only one of [Egypt’s] 36 government ministers is Christian, and there are no Christian governors, even in Christian-majority areas.” Christians are even unofficially barred from playing for the professional clubs of Egypt’s wildly popular national sport, football. Under Article 98 of the Egyptian penal code, blasphemy—defined to include “ridiculing or insulting a heavenly religion or a sect following it, or damaging national unity”—remains a crime punishable by imprisonment. Although the article in theory applies to those who speak against Christianity and Judaism as well as against Islam, in practice it has been applied exclusively for actions or speech deemed critical of or defamatory to Islam, and the accused are disproportionately Christians and other minorities. In just one shocking example, in 2016 a group of Coptic teenagers were sentenced to prison for allegedly making a video mocking the Islamic State in Libya after it had beheaded 21 Christians. Meanwhile, Sisi presides over a vast security state yet has failed to slow terrorist attacks on Christians and their houses of worship. Late last year, Islamic State militants attacked a bus full of Christian pilgrims traveling to a monastery south of Cairo. Seven died, and dozens more were injured—in nearly the exact location as a terrorist attack on Christian pilgrims the year before. In recent years, Islamist militants have also killed Christians in brazen church bombings in mainland Egypt and have targeted Christians in the northern Sinai Peninsula, driving out dozens from their homes. On top of such jihadi violence, mobs of local Egyptian Muslims whipped up by bigoted religious discourse frequently assault Christians for praying in what they call illegal churches or for carrying on interfaith romances. In December, after a spate of such incidents, Sisi created the Supreme Committee to Combat Sectarian Violence. But like many of Sisi’s so-called reforms, this was public relations, not a serious attempt to tackle the problem. As Timothy E. Kaldas, a fellow at the Tahrir Institute for Middle East Policy, noted, the committee “is almost exclusively composed of representatives of Egypt’s varied security bodies” and, worse, includes no representatives at all of the minority faith communities that are especially vulnerable to extremist violence. To date, Sisi’s only concrete benefit for Egyptian Christians was his much-touted 2016 law on church construction, but it falls far short of what is needed. Christians had hoped Sisi would finally remove onerous controls on building and repairing churches—restrictions that do not exist for mosques. 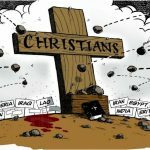 The biased system has left Christian worshippers greatly underserved relative to Muslim ones; the most recent official data suggests that Egypt had one mosque for every 665 Muslims but only one church for every 2,780 Christians. Yet instead of treating the building of churches and mosques equally, under Sisi’s new rules churches are still subject to a special and laborious approval process, in which security officials have vast and arbitrary power to reject permits for construction—even minor repairs. The justification is that allowing too many churches would inflame the Muslim majority and threaten stability. Sisi’s gleaming mega-cathedral in Egypt’s new administrative capital certainly impressedU.S. Secretary of State Mike Pompeo and other foreign visitors. Yet not only is this vanity project located in a military-controlled siteinaccessible to most Egyptians, but it has zero impact on the systemic discrimination Christians face daily. Despite the real dangers that come with speaking out in Sisi’s Egypt, in a recent columnYoussef Sidhom, the editor in chief of Egypt’s most influential Christian newspaper, Watani, warned against allowing “talk by President Sisi when he visits the Church” to “obscure the fact that there are Egyptian Copts who experience neither equality nor freedom, nor can they exercise their constitutional rights.” Other prominent Christian figures have expressed similar discomfort. Christians may be the country’s largest religious minority, but other religious groups have even fewer rights. For example, the Bahai and Jehovah’s Witnesses faiths remain officially banned. Their places of worship, public celebrations of their faiths, and even their marriages remain unrecognized by the state. Official religious institutions such as Al-Azhar and the Ministry of Religious Endowments have engaged in public campaigns warning of the “growing dangers” of the spread of the Bahai faith. And atheists also face growing repression, with Sisi’s parliament even considering making it a crime not to believe in God. Although the Egyptian president is fond of speaking of religious tolerance, especially in front of foreign audiences, his regime treats Christians and other religious minorities just as his predecessors did: as groups to be controlled and collective security threats to be managed, not as citizens deserving of individual rights and freedoms. Sisi, whose solution to any problem, danger, or conflict is to further curtail rights and boost the military’s powers, has shown no vision or willingness to lead Egypt toward a more open, tolerant society. With his rubber-stamp parliament now pushing through constitutional amendments that will allow him to remain in power until 2034, the prospect for significant improvements in the status of Egypt’s religious minority communities looks grim. Yet if the U.S. administration genuinely cares about religious freedom in the Middle East, Trump should replace superficial praise for Sisi with pressure on him to take long overdue steps such as abolishing the blasphemy law and equalizing the approval system for all places of worship. Amy Hawthorne is the Deputy Director for Research at the Project on Middle East Democracy. She focused on Egypt as a State Department official in 2011-2012.